Tropical Fruits. Durian Fruit. All About The King Of Fruits: History, Facts, How To Eat Durian. The Durian’s complex taxonomy is a result of addition and subtraction of many species from the genus durio and the Malvaceae family. It was earlier mistaken to Annona muricata (soursop) as this particular fruit also has a thorny greenish skin akin to the durian fruit. Malaysian people who identify soursop by the name ‘Dutch durian’ emphasize the similarity of the two fruits. Another misidentification is known with the notes of Johann Anton Wienmann (1800) where he classified durian with the Castaneae plant. Indonesia, Brunei and Malaysia are native to the durian tree, though Western countries have known it for more than six centuries. 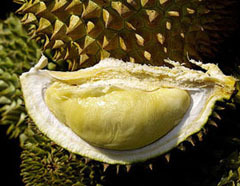 Niccolo Da Conti, a Venetian merchant who traveled to China and Western Asian countries in 15th century had mentioned durian fruit in his documents. Garcia De Orta, a Portuguese physician, mentioned durian in his book named Coloquois dos Simples e Drogas da India launched in 1563. The book, Herbarium Amboinense published in 1974 by the Georg Eberhard Rumphius, German Botanist, also gives a detailed and well-researched account on the durian. The Portuguese introduced Durio ziebethuinus to Ceylon in the 16th century. Many new types were also introduced later. In late 1800, Southeast Asian countries that were first familiarized with the plant started to grow it commercially in 20th century. Edmund James Banfield, a naturalist of Australian origin, got a durian seed in 2000 from one of his Singaporean friends and planted it in Queensland first introducing durian to Australians. 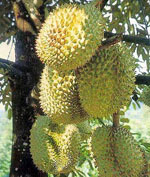 Durian is a native plant of Brunei, Malaysia and Indonesia but some highlight that it is native to Philippines as well. Thailand is one of the main countries that export durian to the international market. Sri Lanka, Cambodia, Laos, Vietnam, Myanmar, West Indies, India, Hawaii, Polynesian Islands, Madagascar, China, Singapore, Northern Australia, and Malaysia as well as some parts of America are also well known as habitats for the durian tree. Nick named ‘King of Fruits’; durian is highly valued in Southeast Asian countries. Durian has a very distinguished smell and its skin is thorny and hard. The dimension of a durian fruit is about 30 – 15 cm and its weight is about three Kgs. Durian flowers bloom in a cluster and there are about three to thirty identical clusters borne on its trunk and large branches. Every flower has sepals and about five to six petals. Durian is round although the oblong shape is not irregular. The shells are green or brown while its flesh is a luminous yellowish or reddish color. The odor of the edible parts of durian is so penetrating; it spreads a long distance even without removing the shell. Some like the aroma of durian very much while some others highly despise its scent. 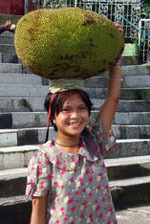 Durian trees yield two harvests per year, but it may vary in keeping with the various climates, cultivars and places. Durian trees bear fruit after 4 -5 years and they take about three months to ripe. From a great variety of durian, only the Durio ziebethinus variety is marketed internationally. Durian is rich in sugar. It is also rich in vitamin C, tryptophan, potassium, carbohydrates, fats as well as proteins. Health professionals frequently recommend it as an effective source for taking in raw fats. However, some point out that as the durian contains a high amount of fatty acids it is advised to limit its consumption. Malaysians use its leaves as well as roots to produce a decoction for fever. A research from University of Tsukuba reveals that durian fruit has significant powers to detoxify the body. Javanese people think that durian is a good aphrodisiac. The durian fruit is quite large. Its size is not a great problem as ripe ones fall in time. They may slightly crack when falling. By inserting a knife or a fair sized cleaver to such a crack, it can be opened very easily. 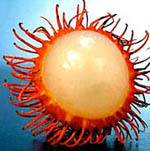 Within, are about five parts and in each one of these, several seeds can be seen covered with an aril identical to custard. 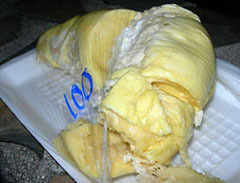 When durian is eaten immediately on falling, the pungent smell is bearable and the taste is also favorable. Durian fruit can be mixed with many flavors to increase its taste. Its seed can also be eaten after it’s cooked. Also visit interesting websites concerning useful and healthy oils: oil of oregano, argan oil and grapeseed oil. Thanks for your durian article, do you know how to PICK a good one from store’s frozen bin? Is durian now growing well in Sri Lanka naturally? and is it exported at all? You want to pick a good frozen one? Look at the Top of the Durian – if you find MINIMAL signs of cracks (or cracks up to one centimeter) you are definitely having a ripe one. But there may not be any large cracks (overripe). If it is symmetrical and a big one (more flesh) its better, too. Have Fun! This trick works 100% if you understand my instructions. i live in SURINAME. A country with very much free land.i want to start a plantation of Durian ,Mangosteen Dragon fruit and Rambuttan. 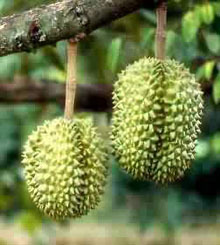 I’m interested with Durian seeds, would you please let me know about it. Copyright © 2009-2019. Tropical Fruits. All Rights Reserved.